When you own a dog you will quickly find out how many types of dog biscuits there are on the market. However, you will have to ask yourself whether they are all good for your dog and if you need to buy them? These days it is not simply the case of picking up a packet of dog biscuits and feeding them to your dog. There are biscuits to cater for ages and shapes and sizes of dog. When you first buy your puppy it will probably be too young to chew on a hard biscuit. Look for small bite biscuits and if this is too much for his young teeth then soak them in warm water mixed with a stock cube until they are semi hard. Those boxes of brightly coloured biscuits may look attractive in your dog’s bowl but are they doing his health any good? Any chemical added to colour the food or to prolong its life could have an adverse affect on your dog. Allergies are a major product from chemicals in food along with cancers and other health concerns. Look on the box for the source of the product, read up on the chemicals listed and decide would you give it to your children – if the answer is no then don’t give it to your dog either. Although crunching on dog biscuits could be considered good for a dog’s teeth you cannot beat a nice meaty bone. Always give the bones raw as cooked bones become soft, and the chewed shards will damage the stomach of your dog and could ultimately kill him. Dog biscuits come in a multitude of flavours and the designs on the boxes look both inviting and tasty to the owner of the dog. However, ask yourself how much is flavour and how much is chemicals that could upset your dogs health and his diet? If your dog is fed tinned wet food or raw meat the chances are that you will want to feed a mixer biscuit as well to bulk up the meal and give the dog something to crunch on. Do not be lured by the brightly coloured mixer biscuits but purchase the bland natural looking biscuit instead. Mixer biscuit is just that a plain simple biscuit that will complement another food. 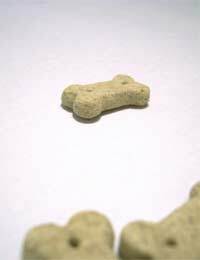 Never use a complete food as a mixer biscuit as you will be over feeding you dog which will result in diet and health problems. These days it is possible to feed your dog as healthily as you do your own family. There are many organic brands of dog food on the market and many of the manufacturers also make a complementary brand of dog biscuits as well. Always speak to your dog’s breeder about feeding. He or she would have given you a feeding guide when you collected your puppy and this guide should also mention chews and dog biscuits as well. Be guided by your breeder who would have had years of experience about what food and dog biscuits is good for your type of dog.